Author of the #1 bestselling book, "FIFTY SHADES OF MARKETING: Whip Your Business Into Shape & Dominate Your Competition"
Naresh Vissa is an employee turned millennial entrepreneur & #1 bestselling author who has recently been featured in the Deseret News, TheStreet.com, and CIO Magazine about his entrepreneurship and expertise. 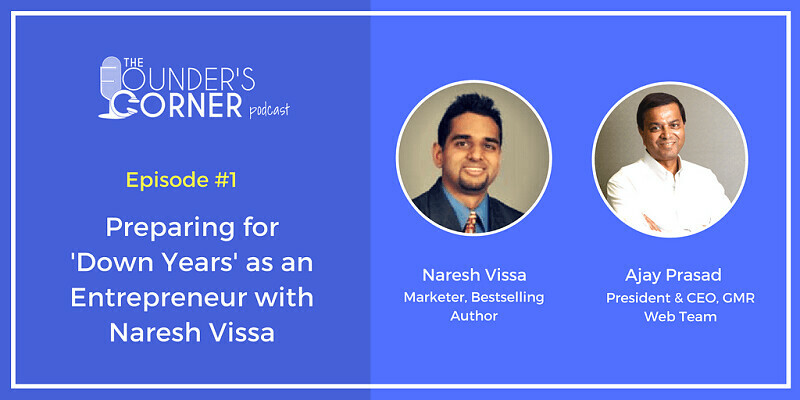 In this episode, Naresh and our host Ajay discuss surviving down years and the importance of transparent pricing. While finishing business school at Duke University, Naresh turned down opportunities in banking to pursue more entrepreneurial roles within the information publishing space. After gaining some experience, he incorporated his first consultancy, Krish Media & Marketing, more than three years ago and have launched several other businesses and written a couple of books. Ajay: Hello. I'm Ajay Prasad. Welcome to the Founders Corner. Here with me I have Naresh Vissa, Founder and CEO of Krish Media & Marketing and COO and Executive Publisher of Normandy Investment Research. How are you today, Naresh? Naresh: I'm doing great, Ajay. Thanks for having me on. It's a pleasure to talk to you. I look forward to learning more and gaining some insight on some of the business issues that I'm currently tackling. Ajay: Fantastic. So tell me a bit about your business and your entrepreneur journey. Why don't you give us your quick background, and then talk about your businesses and then we can talk about your issues. Then I went to business school and again I thought I would continue with the corporate path. But on the side, I always offered mu services just so I could make some money and get some experience on the side. My side hustle ended up getting me a full-time job with one of my clients. I took over a project. And while I was working for that client, I learned an entirely new industry which is the financial publishing industry. Financial publishing is, if your listeners are familiar with the Motley Fool or the Street.com, it's the publishing of investment research and selling that research to individuals. So helping them manage their money, helping them with stock picks, bonds, etc. So I went on my own officially for good. I left the corporate world behind in 2013. So for almost three and a half years, coming up on four years, I've been on my own. I first started my consulting company, Krish Media & Marketing, which began as a financial publishing consulting company; that has since expanded to be an online business solutions provider. So anything online-related; project management, web design, web development, logo design, copyrighting, publishing, affiliate marketing, etc. ; anything that's digitally oriented we have a team of people who can work on projects or we have solutions for folks. My clients in that space are big, publicly traded companies but also doctors, lawyers, real estate entrepreneurs, etc. so we really cover everybody. Because of my background in financial publishing, I also started a couple of financial publishing companies since then. Some of them I've shut down within two to three months because there just wasn't a market. Some of them I've exited, where I've sold my take. And then some of them I'm currently running, like you mentioned Normandy Investment Research. That was an acquisition I made with a team and we're in the turnaround process for that. Another company that I started is called Moneyball Economics, which is another big data economic forecasting firm. We help individuals again manage their money through our forecasts of publicly traded companies and their earnings releases. That's just a little background on who I am in the financial and online digital spaces and what I do. Ajay: That's interesting. Because these are two separate but at the same time very involved businesses, how are you managing to run both businesses? Ajay: We work from an office. We are old fashioned, unfortunately. Naresh: My guess is that you or your employees are spending at least an hour and a half a day just commuting to and from the office. In my case, I work from home. Everything that I do is digitally oriented. So for our meetings, we do it on Skype, which is how we’re doing this interview right now. We do it on Skype or I use an app called Voxer, which is a walkie-talkie app. I prefer people to just send me messages there instead of conducting meetings. We're a digital company. The people who work for me, they are located all across the world; India, Eastern Europe, United States, Philippines. We're very spread out. The beauty of managing these businesses is because I hire people who already have an expertise, I don't have to worry about hiring and training. I don't have to worry about providing health coverage. These are people who are ready to rock and roll. They respect their time, I respect their time. So when I give them work to do, the work gets done pretty quickly. So there's no time wasting. People have a good work-life balance and we do our work. In fact, the amount of meetings we have now is minimal. Maybe once every two months if there's something important, we'll have a conference call or a meeting. But otherwise, we keep in touch through either private Facebook groups, or the Voxer app, Skype, email, text message, phone, etc. So that's freed up a lot of time because there's no commute for me. I work from home. I'm well rested, I'm able to sleep well at night; I get eight to nine hours of sleep. And when I sit down to do my work, I'm incredibly productive; incredibly, incredibly productive. Ajay: Wonderful. That's good to know. Obviously, all of these people are independent contractors so they work with you on a project basis. Ajay: That's definitely the trend. Naresh: I recommend it. Through Krish Media & Marketing, other companies hire me, hire my company as we contract out our work. So they essentially hire us as independent contractors. It's good for them because they get the expertise and the quickness and they don't have to worry about hiring somebody full-time and paying them salary, and meeting payroll, and healthcare and all that. It's definitely the way the economy is moving towards. I'm a huge fan of it. And at the same time, you hear all the time in politics these politicians talk about how they're going to create jobs. None of them really understand the digital economy and the way that business and the digital world is moving. And the act of creating full-time jobs, they have no control over it. They have no control over this because more and more companies are going to start cutting costs and hiring expert-based contractors. Ajay: That is a discussion for another time. But yes, I agree with you. The workforce has become very global for almost everything. I now meet with companies where technically they have offices in three or four different countries and they are just small offices. So they just create offices on the strength of that particular company. So they may have a programing team in India but a call center in Philippines and something in Ireland. It's really interesting how even the smaller companies - I'm not talking about massive companies having it. The smaller companies are getting there. It makes a lot of sense. three or four different countries and they are just small offices. So they just create offices on the strength of that particular company. So they may have a programing team in India but a call center in Philippines and something in Ireland. It's really interesting how even the smaller companies - I'm not talking about massive companies having it. The smaller companies are getting there. It makes a lot of sense. Naresh: Ajay, I'll admit that since I got started nearly four years ago, has it been bumpy? Yes, it has been bumpy. But my first year in business, it's like I gave myself a 20 percent raise. It was almost too easy. I was getting clients, they were paying me good amounts of money. I was working from home, I was living a great life. And then the bumps happened. But things haven't been so bad. Have I shut down businesses? Yes. Have I scrapped projects? Yes. Have I pissed off clients? Yes. But things haven't been so bad to the point where I've had zero cashflow or the ideas or the projects or the industries have dried up. So I have to ask you, because I know you've been in business for a very long time, there are going to be some down years coming up. I got started post-recession, for example. There are going to be down years. Whether I want it or not, it's going to happen. And I don't know when it's going to happen. But what's the best way for entrepreneurs to prepare for these down years, without even knowing when they're going to come? Ajay: Actually, I started my business in 2004 so I did go through that recession while being a very young company. So I can bring some perspective for you. First things first, I tell all entrepreneurs that you have to have a product that is of real value to your client. That has to be a starting point. If you have a product or a service that is very [inaudible] [00:10:46] to the company business, then of course you are more dependent on these ups and downs of the economy. There are a couple of things that come from preparing for down years. The first thing, obviously I don't even need to tell you. Bill Gates said it very well when he said that even for a Microsoft kind of company, I want to make sure that I have one year of expenses in the bank all the time to run the company. Not all entrepreneurs can do that but I always say that. Because downtime will come, and you just want to make sure you have some runway so that you can still take off and not crash. Having said that, the first thing I would say is if you already have customers, like in your case you have it really easy for the customer. So you have obviously figured out how to get new customers. So first thing, you want to make sure that you hone into a marketing process rather than program, that you know that you can use and you can get customers. It could be as simple as I have to spend $500.00 on paid advertising on Google to get a client. So just understand how you can get more customers. For the downtime, if you have customers, the first thing is you have to totally focus on customer retention. I had the same problem as you in the beginning, actually. I was worse when I started; I lost most of the customers. Until I realized that there is something called the ideal customer. I shouldn't just take anyone who walked through my door. And the moment I started to focus on the right customer and providing the service, the first thing is retention. That helps you from the downside, especially for a product like yours where a lot of it is subscription-based; you have a monthly fee. The second thing you should be doing, the moment you have happy times you have to start thinking what are the other products that you can sell to them. The moment you start to have those other products, because your happy customers are most likely to buy your products. So you have to have a growth plan around it. The one thing I will tell you about entrepreneurship is because you are so small, generally speaking the downturns don't impact you as much, unless you are totally tied into that business. For example, if you have an investment newsletter and people stop investing, which happened in 2007-2008 where they just dumped stocks and it was like oh, I'm never going to get into stocks again. Then obviously, you are going to lose customers and you may have a very hard time recruiting for it. But then you have to think about what are the other products you can offer. If they get out of investments, that doesn't mean they are going to take the money and put it under the mattress. So that becomes your challenge, talking about it. But generally speaking as an entrepreneur, downturns don't impact you as much because you are very small and you are just learning and figuring out your marketing and starting to get more customers. For example, I never had that problem, even in the worst times. I grew over the last year but my baseline was so small that growing was nothing to write home about. So I would say yes, you have some reserve. You have to talk to your customer, find out what else can you offer to them. So that way, you are diversified. If you have more products that your customers are buying, you are also diversifying your risk of a big drop-off. Naresh: One thing I want to talk about is Krish Media & Marketing, which is the online business solutions firm because that's client based, whereas my other two businesses are customer based, product oriented. I'm curious to hear your thoughts because my business model for Krish Media & Marketing, because we are a digital firm and we don't have offices, we're kind of bare bones. And as a result, we're able to charge our clients low prices. And I still make sure that it's worthwhile for me and I'm making good money. But I tell my clients if you find someone who charges lower than we do and who does a good job, then we'll match the price. And nobody has actually taken me up on that offer; everyone's just gone ahead and paid the price that we charge. But because we are low cost, I think if a recession or if bad times hit, I think my company might actually perform better because we’re offering these services at a lower cost. And companies might cut their employees, or they might cut that big, brand-name company who does their PPC or SEO or design work, and instead go with us and at the discounted price, get the same quality service. Ajay: Naresh, here is my perspective on that. Obviously, that is your strategy. Your strategy for getting customers is either you want to be a price leader, or you have some unique or better proposition that you sell around that, the value proposition. One of the challenges that you'll find being a price leader is also being considered a quality company. That is the challenge. Because even if you are the low price leader, you have to make sure that you have some unique value proposition; something you can claim that other people can't. That becomes your challenge. Personally speaking, I find it very hard to support a low price, price leader brand positioning simply because it's just a race to the bottom. You could be offering something, say a web design for $2,000 and then all of a sudden a company in India starts to offer it for $500.00. And because people are buying based on pricing, they won't know the difference. So that is something that you have to be careful about. I am a big believer in figuring out who is your ideal customer. If you know who is your ideal customer, the customer for whom you can create the best value, I will stick to that. Because those are the people who will stay with you. Generally speaking, very few businesses expect to pay a tiny bit and get a lot. The concept of getting your money's worth is still there. Again, as long as you are creating real value for your business, it really doesn't matter if you’re charging them $10,000 and if the value you are creating for them is $30,000, they're not going to flinch. That is just my perspective. I know that many companies have focused on pricing and have succeeded. Although I will tell you that in the digital marketing arena, I have not seen many really low price leaders thrive unless you are talking about companies like web.com or wicks and all those who went with that model but had literally millions of dollars in funding. Even then, I don't think the final story is written. We don't know where they are going to go or how their model is working right now. That is my two cents. If you want to be the price leader, you really want to be the price leader. So be ready to compete at any price. Because when you say I am going to match the price of someone else, of course if they put it on Google kind of website, then you'll be competing with a few hundred dollars for your project. Personally, if you ask me, I think that strategy is very hard to defend in the long run. But if that is your strategy, make sure that your price is always the lowest in the industry. If you can manage that, yes, you can defend that strategy. Naresh: I'll say this, and I think I touched on this. I mentioned that yes, we do price match. And I tell my clients if you find someone who's offering a better price, we'll match it. I've worked with at least 60, 70 different client over the past six or seven years. And not once has someone actually gone out and said hey, this guys said he'll do it for a lower price; can you match it? Not once. Ajay: So in that case, why do that? Naresh: I guess it's more of a persuasive strategy. Of course we will match the price if the quality is comparable and their portfolio is comparable, or whatever it is that they do is comparable. Yeah, we'll match the price; no issues. But it's almost like a persuasive strategy. Hey, I'm not trying to rip you off by charging you this $2,000, $3,000. I'm not trying to rip you off. I'm trying to give you the lowest price that we can offer. And if you find something better, we'll go ahead and match it. And there’s a reason for it that I wanted to touch on, and you can follow up with your comments. I've been in two business-related lawsuits in my life with clients so far in my seven-and-a-half years in business. Both of the issues, both of the lawsuits were a result of high prices that I was charging. We delivered everything that the clients asked for. We delivered everything, the quality was top notch, everything was fine. But both of these companies, and again these were not huge, Fortune 100 companies; these were small businesses. They had five to ten employees but they were small businesses. They were saying that I ripped them off and they wanted their money back. Their response was you charged us too much money. Even though they agreed on the contract, they paid the money, or they paid half of the money and didn't deliver the other 50 percent. Even though it was all agreed on, they still had problems. Ajay: What happened after the lawsuit? Who won? Naresh: Of course these things never make it to court. The first lawsuit, the client ended up paying in full and they also paid my legal fees and everything. It didn't make sense to me. So they actually lost money because they paid me in full and paid for the expenses. The second one, the client, it's a long story. It was really bad because I had to travel to work out of their office. What ended up happening was they tried to force me to cut the contract. And I told them, a deal is a deal, a contract is contract; we're going to continue delivering our services and we expect to be paid. What happened about eight months later, we had lawyers involved. They went after each other, they bullied each other and we reached a settlement which was a decent settlement but I think I deserved more. That's another story. Ajay: Naresh, I think you answered your question. When you are charging the price and there's a contract, and they know clearly how much you're charging and what you'll deliver, as long as you deliver that, you are fine. If someone wants to go through a lawsuit, it's their job because you'll always come out ahead.